The ability to bump up smartphone and tablet storage is an invaluable one to many. What with app sizes growing and mobile cameras shooting in 4K, many find that a 32, 64 or even 128 GB ROM simply doesn't cut it. If you find yourself regularly flirting with the dreaded 'insufficient storage' message on your device, Amazon has you covered with a pretty sweet deal on SanDisk's 200 GB microSD card. As part of Amazon's Deal of the Day, you can snag the SanDisk Ultra 200 GB Micro SD (SDSDQUAN-200G-G4A) for the price of just $59.99. This is the same discounted price we saw a few months back, and gives you a saving of almost $20 from the regular price. Since it's a one-day-only thing, you'll need to move quickly if you want to treat yourself and your device to a sizable dose of real estate. If you don't require all of that extra space, there's also the 32 GB ($10.59), 64 GB ($19.69) and 128 GB ($39.99) to be had. It should be noted that some devices — particularly lower-end and older models — may not support a 200 GB microSD, so you may want to double check before you part with your money. If you want to score a microSD on the cheap, hit the source link below. I got this deal before with free priority shipping to uae! I would not buy this card. 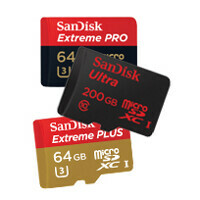 Only buy Sandisk extreme of extreme pro cards if you want decent performance. The read and write speeds on this card are pretty low. U3 for 4k folks and not this U1 crap. ROM doesn't mean what you think it means. I bought this 200GB card last spring when Amazon had it for $60. It's been installed in my HTC10 since I got it. This card is perfectly acceptable for smartphone media (music and videos) storage. The only time I've noticed any performance issue was when I was writing all my music to the card when I first got it. It's perfectly fine for photo and video (up to 1080p) capture. I don't take video at 4k so I can't speak to its performance in that regard. Overall I am extremely happy with this card, and would buy another if my phone had a second slot.